Syndicated advice columnist Amy Dickinson will be presenting "Always a Bridesmaid, Never a Dairy Princess: Mostly True Stories of Small Town Life", on Friday, August 10th at 7:30pm at the Dryden Village Hall. It's a fundraiser for the Southworth Library. If it's as good as her previous presentation in Freeville, I strongly recommend it! Farm City Day will be Saturday, August 11th, from 11:00am to 4:00pm at Lew-Lin Farms, 433 Livermore Road. Farm City Day in 2005 was great, and I suspect this will be fun too. Dryden Sertoma will be registering for the Fall Youth Soccer Program for Dryden schools' students from 9:00am to 11:00am. The Intergenerational Band and Chorus - a joint Dryden-Groton production - will be performing on August 11th at 7:00pm at Groton High School and August 12th at 3:00pm at Dryden High School. Mark Rust played tonight at Montgomery Park, but will be back tomorrow at Ellis Hollow Community Center at 6:30. Backtalk Band will play next Wednesday at Montgomery Park, followed by The Homegrown String Band of August 15th. Southworth Library will be having its last Family Fun Night of the year on Tuesday the th at 7:00pm, with musician and puppeteer Tom Knight. In good weather, it will be on the library lawn; if it rains, it will be in the Dryden Fire Hall. The Journal's editorial praises TC3's free tuition semester for veterans. I was driving down 13 yesterday when emergency vehicles poured down the road, swarming on 1890 Dryden Road, where it was clear someone was injured in a barn being dismantled. Alas, a 29-year-old worker was killed there when a beam dislodged and struck him. On the opinion page, Clifford Norte of Dryden writes to complain about Dryden schools keeping school lunch prices the same while the program runs a deficit. I do hope to be posting more here soon, and replying to email. Work's been way out of hand, including travel, and catching up hasn't been easy. I know there's a New York Power Authority, but this isn't about electrical energy - it's about the concentrations of political power that New Yorkers take for granted. New York's "Three Men in a Room" style of governance concentrates power in three people - the Governor, the State Senate Majority Leader, and the Assembly Speaker. Only one of those, the governor, is directly elected, while the other two come to their power from houses elected by gerrymandered districts, supported by rules that give them control over both the flow of legislation and the perks that other legislators receive. It's been like that for a long time, though perhaps it got worse when the Senate and Assembly decided to let each house draw its own district lines without interference from the other. The Republican party controls the Senate, and the Democrats the Assembly, and the result has been paralysis for decades. It seems that Spitzer has fallen headfirst into the classic Albany story: get things done by applying the power of your office by whatever means necessary. There's not a lot of interest in democracy in Albany, at least not the kind that involves public involvement in decisions, but there is a lot of interest in making things happen. Much as I hate to say it, I have similar fears for my own party, the Democrats, when we finally take over the New York State Senate. Unless the demographics change drastically, even Joe Bruno's willingness to bend the usual rules in his favor can't last forever. At some point there will be a Democratic majority in the Senate. Will they fall into the same power trap as the Assembly and (alas) the Governor? I wish I had more faith in the system, but watching minority Senate Democrats share a party with majority Assembly Democrats (with the opposite dynamic on the Republican side) doesn't give me a lot of hope. I'm not quite ready to give up on New York State government, but I think it's time to start looking for options that break out of the usual "seize power and make a change" story in New York. I'm not yet sure what that would be, but I'm afraid it's probably going to mean electing people willing to sacrifice their own power in favor of changing the way New York State runs. There's aren't nearly enough of those people, they're rarely politicians, and voters often don't like that storyline - but I don't see other options that are likely to work. Most of the Dryden activity in today's Journal is on the editorial page. Henry Kramer of Dryden writes about possible government consolidation. While I rarely agree with Kramer, there's a lot worth considering in this article. I agree completely that we need small units of government that are closer to the people they represent. (He suggests the Ithaca School District as an overlarge entity, and I suspect he's right, but I regularly hear from people that even the Town of Dryden is too large.) I'm not as convinced about eliminating county government in the cause of reducing duplication, if only because New York State feels far too large to me for a one-size-fits-all solution. There's lots to think about though, and there's a contrasting view from David Whitmore of Ithaca too. Also on the opinion page, Murray Cohen of Dryden suggests that part of the problem affecting sports today is the emphasis on records and statistics. On a personal note, I was happy to see this article on the New York State School of the Media Arts, held these days at Ithaca College. I attended it back in 1986 when it was at SUNY Buffalo, and I think what I learned there is a lot of why I write this site. is seeking applications for funding for youth programs for next year (2008). This is not for recreation programs but instead for programs that help build skills and provide opportunities for youth living in Dryden. And even if you're not applying, the assessment is worth contemplating. 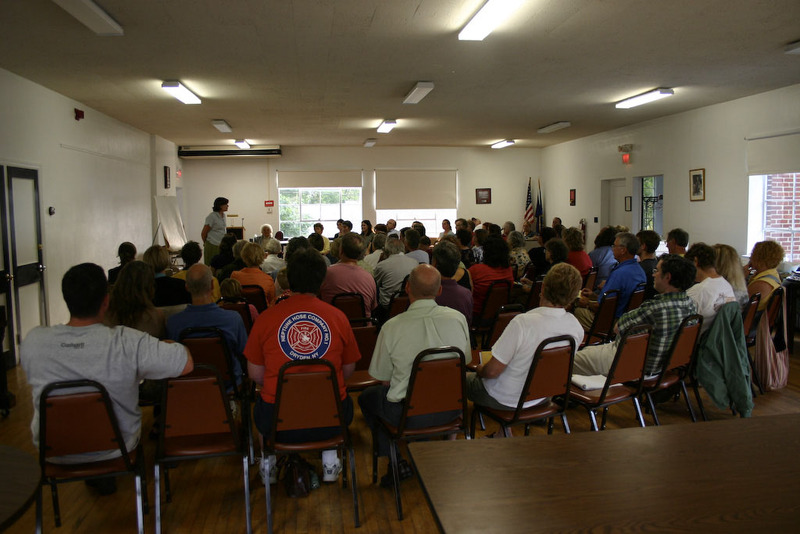 Community center discussions in the Town of Dryden tend to polarize east-west. The west side has community centers, while the east side has schools and villages. On the east side, fire departments often provide space for community events, there's a greater sense of belonging to a place, and village governments provide another outlet for neighborhoods to get things done. I've wondered for a while if it was really that simple, and if it was good for it to be that simple. The Village of Dryden has had some ups and downs lately, with storefronts emptying, Charlie's Diner getting in a Spitzer ad highlighting upstate decline, and the disappearance of what had briefly been a great Victorian Winter Festival. Maybe there's room to do something interesting? Looking for community input; planning is still getting started. They'll be having an organizational meeting on Thursday, August 23rd, from 7:00pm to 9:00pm at the Dryden Village Hall, 16 South Street. It would be great to see this flower! It seems achievable, and a real opportunity to build stronger community in Dryden. As part of the transition to eating locally, I went through our cupboards and pulled out unopened food to give away. I'd like to give it to a food pantry, preferably a local one like the Dryden Kitchen Cupboard or the Freeville Food Pantry, but I can't find any information on how to contribute to them. The Food Bank of the Southern Tier's page about donating food is kind of mysterious. Loaves and Fishes in downtown Ithaca is looking like my best bet, but if anyone knows how to donate to the two in Dryden, please let me know! This morning's Journal has little Dryden news, except for some DWI and related charges in the Monitor. The bigger crime news is Ithaca-focused but also mentions Cortland, so I'm guessing they drove through Dryden at times: a federal racketeering indictment against an alleged drug crew. Breaking news also has word of more drug-related convictions in Tompkins County. I was a bit worried that my latest piece on New York State politics was too abstract, but NYCO nicely rescues it with an excellent piece on a strategy that might give New York State participatory politics again. Her idea, which stems from a comment at The Albany Project, recognizes an essential but painful point in New York politics: no one with real power is willing to give up that power except those who are being forced to lose it anyway. Read her article for the complete story, but it makes me wonder who can convince Joe Bruno to set at least some things right when he finally departs. It could be a very exciting December, in 2008 or 2010. 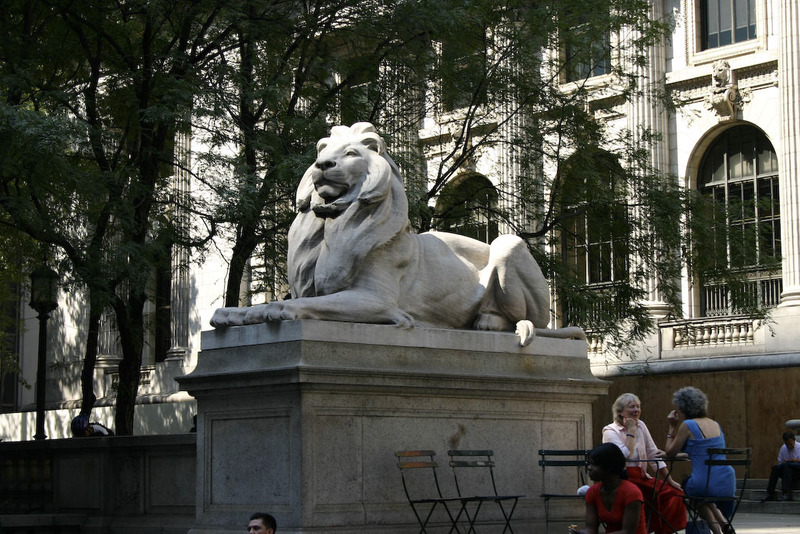 On a different note, Governor Spitzer has taken up blogging. The main Dryden news in today's Ithaca Journal is two letters supporting the Ithaca Drop-In Children's Center, and protesting last week's county legislature committee vote not to support it with additional funds. Christopher Lyon of Dryden and Mary-Beth Martini of Dryden both urge the county legislature to support it. We decided back in June to start eating locally in August. We let our supplies dwindle coming up to the end of the month, though my being in the land of Burgerville didn't help with that. We gave away our remaining non-perishable goods, and stopped buying things that weren't from New York or Pennsylvania. The farewell party Angelika's Cornell co-workers threw her left us with a lot of leftover chocolate cake, so there hasn't been a chocolate shortage until now, but that's gone and we'll likely notice the difference soon. 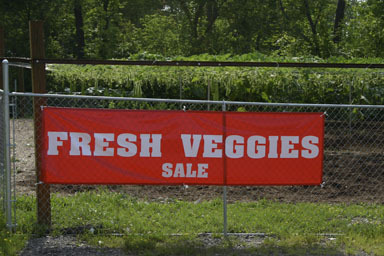 Some folks are even helping us out with Dryden-fresh produce. Besemer Flats produce inside: squash and zucchini. Another highlight was tonight's Dryden sweet corn from Back to Basics. I definitely need to get more of that! We've managed to borrow (!) a chest freezer and a dehydrator, so I think we'll end up well-stocked for the winter. We picked fruit at (well, Angelika really picked while I visited my parents in Corning) Little Tree Orchards over in Newfield, coming away with a huge pile of delicious tart cherries, black caps, and black raspberries. We've had some currants, and Ludgate Farms also had local currants, both red and black. The blueberries in the yard are just getting ripe now, and it looks like we'll have a better crop than we've had in a few years. We'll supplement that with more picking. I also bought three frozen chickens from a friend in Lansing, and reserved a turkey for Thanksgiving there too. Between our own garden and local produce, it's not very hard to eat locally right now. So far, finding cereal grain seems to be a bigger problem. I really miss Grape-Nuts™, but we made some delicious granola in July using rolled grains - wheat, rye, spelt, oats - whose source we don't know. 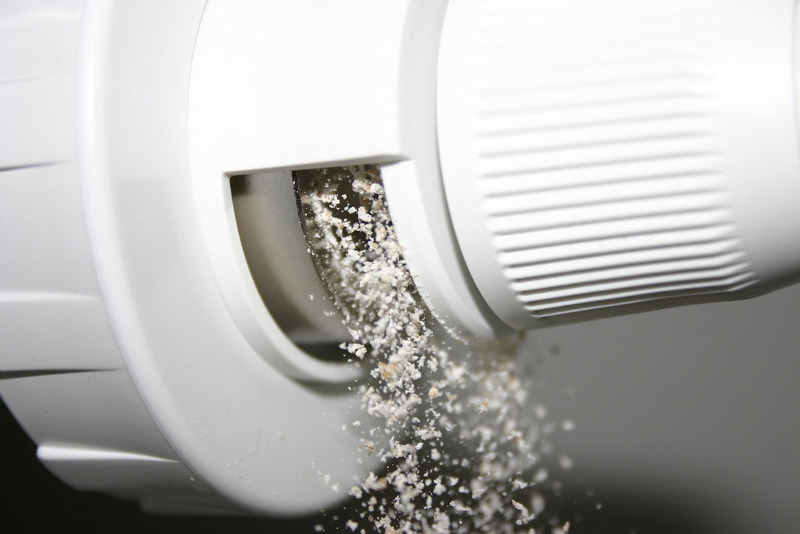 I've not yet found a source of rolled grain here, but it looks like we're just going to buy grain and do the "roll your own" thing with grain. We're missing a key component of salads: cooking oil. I can substitute butter for a lot of things, but butter in salad just feels wrong to me. The NOFA-NY site lists a soybean oil producer I need to track down. We'll be out of our remaining open olive oil soon. It's also interesting to see some skepticism rising about eating locally. This New York Times op-ed (registration required) points out that there are cases where local isn't necessarily more energy-efficient. Sure - England's overworked soils can't compete with New Zealand's paradise for sheep. Growing chocolate and banana plants in greenhouses isn't likely to make sense either. Driving inefficiencies in getting and distributing food may be higher for local food, and you can certainly burn away any energy savings in local food by driving to the far away grocery store or farmers' market too often. If you try to grow foods that aren't in season, you're also going to find yourself consuming a lot of energy. It seems, though, like most of these problems can be avoided with a bit of common sense that our current system has encouraged us to forget. Eat foods in season, process foods you'd like to keep as energy-efficiently as you can, drive as efficiently as you can, and help build distribution networks that take advantage of whatever local economies of scale are available. It's not that it's impossible - it's just that we've spent the last century forgetting the skills needed to make that work. Part of the reason this is worthwhile is that it requires some lifestyle change to make sense, and those changes make sense too. It's certainly interesting if at times frustrating to try to make sure you know where your food comes from. I'll have a lot more on this as we get further into it. 13's Fall Creek bridge 'obsolete'? While reading the Journal's article on Route 96 repairs and being glad that I don't drive there very often, I noticed a comment directing me to a list of obsolete and structurally deficient bridges in Tompkins County. functionally obsolete bridge has older design features and, while it is not unsafe for all vehicles, it cannot safely accommodate current traffic volumes, and vehicle sizes and weights. It's not the lowest bridge rating in the county. There are two worse ones. I'll try to get more data on what that 64.9 means exactly. Its being "functionally obsolete" is part of the rating, and that may just mean that it's not considered wide enough for the traffic it carries, but the rest I'm not as sure about. This morning's Ithaca Journal reads a bit like an echo of this blog last night. I worried about 13's bridge over Fall Creek, and there are reports on how the state has diverted money from the highway fund for years and on the governor ordering bridge inspections, though only of those bridges with the design that failed in Minnesota. "2,206 of the state's 7,604 bridges were rated deficient last year, a consistent number over the last three years." Ouch. I wonder how that compares to other states. I also wrote about eating locally, and Patricia Brhel writes about local food in Caroline. If they lose their child care over night and those families can't replace it, those families lose their jobs, and we're at risk of actually being fined lots of money by the federal government for falling below the (minimum) percentage of people on public assistance who are working. That same article notes that the county will be putting the Health Department on Brown Road in Lansing, not at the hospital or the NYSEG building as originally proposed. I suspect Trumansburg residents won't find that a big improvement over the NYSEG building, but I guess it's a few miles closer to them. At least one recent Dryden burglary has seen arrests, for the theft of a drill from Saunders Concrete. I dropped my car off at Varna Auto Service this morning, and Angelika and I were going to walk home with Sprocket. (Spring isn't feeling well.) We had walked up across the street from the Methodist Church when we noticed a little kitten lying in the grass. It seemed unafraid but not quite right, and when it opened its mouth there was a bit of blood. I went back to Varna Auto Service to get the car, so we could help it, but when I returned, someone else familiar was there: Chris, husband of fellow Dryden blogger Beth, of Loxosceles. She came over a few moments later. He'd heard the kitten get hit and moved it out of the road to its current place, and called the SPCA. Angelika petting an injured kitten along 366 in Varna. The SPCA minivan came by, full of animal carriers, and the woman collected the little kitten who was starting to move around a bit more. She took the kitten to the SPCA, but couldn't do anything about the other two kittens we'd seen while waiting. Angelika called the SPCA later this afternoon, and the kitten was doing well so far. It seems like Chris helping it out of the road was critical, and the kitten will now have to heal. I'd earlier heard a complaint that students had left behind a pregnant cat at the end of the school year, and the SPCA wasn't eager to take in the kittens. I don't know if this was one of those, or if the area just has a lot of kittens. The Dryden Town Board will be meeting tonight at the old Dryden Town Hall, 65 East Main Street, Dryden (map) at 7:00pm. One of the items on the agenda is "Discuss Moving to New Town Hall", which makes me wonder if this might be the last meeting in the old building. Not on the agenda, but coming up, is the budget process for next year. Town Board member Mary Ann Sumner has posted the start of an explanation of where money came from and went to in 2007 (with graphs!) that's well worth exploring. It's already pretty hard to get from the southwest corner of the Town of Dryden to parts north, but it's about to get harder: the county will be closing a key bridge for repair on the 13th. David Makar reported it on his blog, and I know it'll make it harder for him to get to Town Hall. This morning's Ithaca Journal visits Amy Dickinson, the Ask Amy advice columnist, at her home in Freeville. She'll be presenting tonight at the Dryden Village Hall to benefit the Southworth Library, though, alas, the event is sold out. In other good Freeville news, a state grant of $3 million plus $187,000 in tax credits will help renovate the Lehigh Crossing senior-living facility. 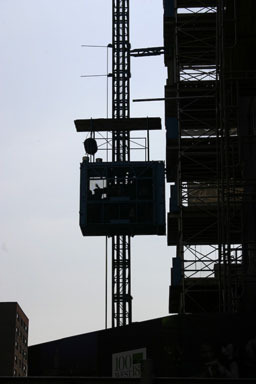 Upgrades will include elevators, accessibility improvements, and energy efficiency. Community News reports on Dryden Ambulance winning the 2007 Central New York EMS Agency of the Year award. The Journal's editorial reflects on the sudden interest in infrastructure caused by the Minnesota bridge collapse and how it might shift New York priorities. I wonder if they'll ever get around to printing the list of obsolete and structurally deficient bridges in Tompkins County. 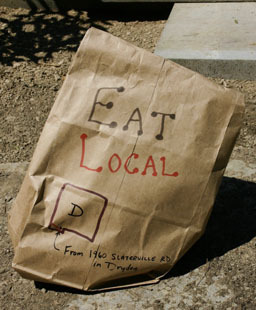 This week's Dryden Courier has a long article about the Dryden school lunch program's deficit. Last year's contingency budget forced benefits into the program's budget, creating problems, but there seem to be a lot of other issues as well. There are two photos of the kitchen at Freeville Elementary School, with Lonnie Boyer at work. Also on the front page is tomorrow's Farm City Day at Lew-Lin Farms on Livermore Road. I can't make it, but I loved the 2005 Farm City Day on the Marquis Farm, and highly recommend going. It has activities for the whole family, and runs from 11:00am to 4:00pm this Saturday, August 11th. The Courier visits budding chef Joel Whitmore of Dryden, and prints his recipes for a dry rub and barbecue sauce. They also list the winners from the recent Tompkins County 4-H Youth Fair, including a lot of Dryden residents. Matt Cooper's Inside Dryden column reports on Amy Dickinson's coming presentation tonight. He also has an update on Beyond Measure, the Dryden High School a cappella group, notes that Sertoma soccer registration is tomorrow morning at Dryden Elementary (forms are accepted through the 18th), notes that the Intergenerational Band will perform August 12th at 3:00pm at Dryden High, and reports on an infestation of "fat, slow, green flies". There's a photo of Douglas McVarish surveying for historical landmarks along 366 in Freeville, apparently as part of inventorying for future roadwork. Harry Weldon's Anecdotes and Brevities column starts with concerns about the recently renovated piece of Route 13 through the Village of Dryden, where "there are big chunks of pavement that are being ground to a fine dust on a daily basis." Local blogs in some areas include community event information, but blogs are not edited in any way, shape, or form, and are often wrong. Blogs also make little pretense of objectivity and therefore may ignore any particular event because they don't happen to think it is important. Wow. Not to bash the Courier, but it's not exactly renowned for its editing prowess or its completeness. I'm very pleased with Matt Cooper's work, and enjoyed that of his predecessors, but never really thought of the Courier as complete, objective, or even (some days) necessarily correct. Apart from the historic level of editing, I'd say the same about the Ithaca Journal and Cortland Standard, so it's not like it's in bad company, but I'm not sure why a piece soliciting reader contributions needs to start with a blast against the competition. Maybe they're concerned that the rise of self-publishing blogs will make it harder for them to get material from readers for free? I know this blog is far from perfect, but wow. While the half-price adoption offer is temporary, Smith said adoption rules have changed since February. The former rules were too stringent, and she is urging people to give the SPCA another chance. "We're not looking for ideal homes for pets, just good, responsible pet owners," she said. I'd heard some complaints from people who couldn't adopt at the SPCA, so hopefully this will help address that. 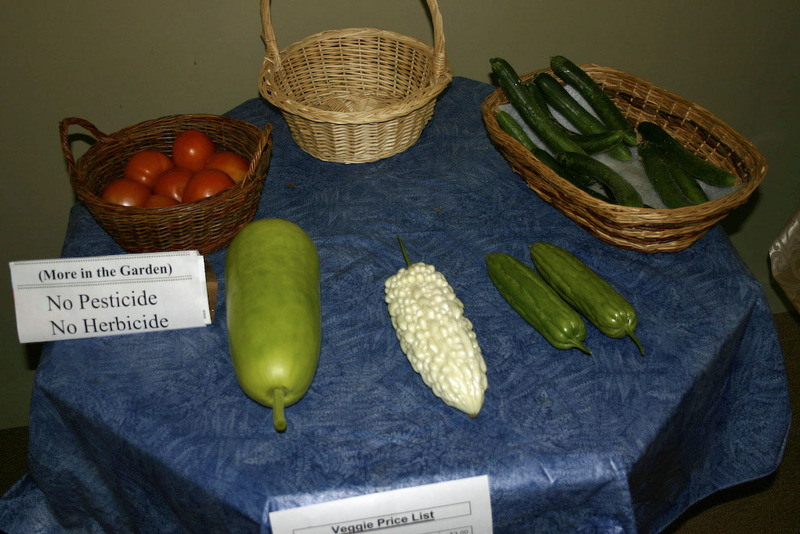 I'm sorry to have missed it, but the Journal visited Farm City Day at the Lew-Lin Farmin Dryden. Mary Ann Sumner posted more of a story and photos. At the national level, the Journal profiles Dryden's new congressman, Mike Arcuri. The opinion pages are mostly quiet, but it's good to see a laurel from the Dryden Town Board to Dryden Ambulance for their 2007 Central New York EMS Agency of the Year award. Cathy Wakeman's Dryden Town Talk reports today on Dryden High School a cappella group Beyond Measure's three days of rehearsal in the days leading up to the start of the school year. The group seems amazingly dedicated, and its continuous success since it started amazes me. Wakeman also reports on next Thursday's Village of Dryden Community Center and Cafe meeting, which will explore the possibilities for creating a non-profit in the former Charlie's Diner, and announces the Varna Methodist Church's upcoming chicken barbecue, which will start at 4:00pm on August 25th. A report on a lawsuit for fraudulent sales of health-care services to senior citizens notes two Dryden consumers who were allegedly bilked. This morning's Ithaca Journal reports that Dryden schools superintendent Mark Crawford will be leaving Dryden to become superintendent in Hamburg, NY. Crawford, who has served as Dryden superintendent for three years, grew up in the Hamburg area and has family there. He will continue to serve in Dryden through October. Also on the opinion page, Cindy Pataki of Freeville expresses her concern about the feral cats in the area and calls on readers to support the SPCA. I came home last night to find my house without power, and apparently a lot of other people had similar problems with the weather. The night before last we'd watched a dead tree topple into our yard, so it's been an interesting few days. The Journal has an extended piece about the costs of healthcare in Tompkins County. While it doesn't mention Dryden residents directly, I suspect we all understand what they're talking about. Also worth noting - bridges are the responsibility of the state or the county, not the town - even when the bridge involves a town road. 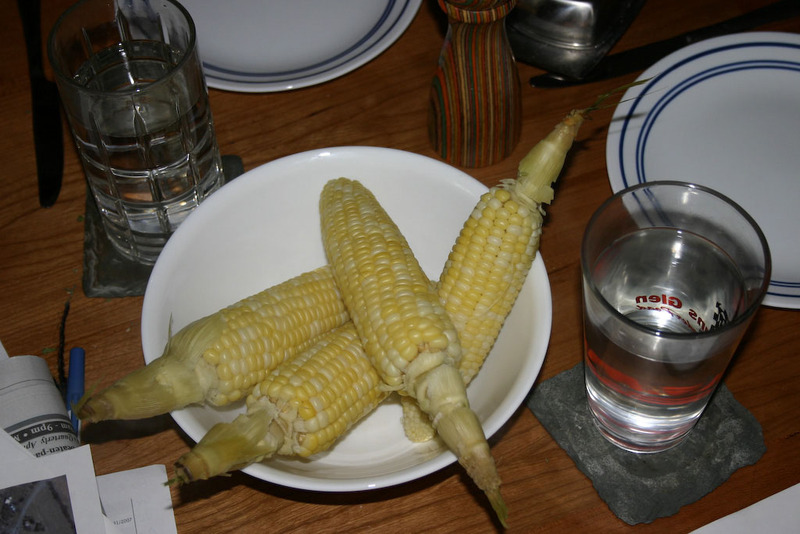 This month, it seems like I can get most of my basic food needs around Tompkins County. It's a great time to Buy Local: Taste the Difference!, as a current campaign would have it. This weekend they had a Farm Trail Open House. While it didn't include any Dryden farms, it did include one place on the Caroline-Dryden border that produces a key food I thought I'd have to look toward Rochester to find: wheat. The Historical Society had a booth at Judy's Day a few years ago. We had been asked to present information on wheat. We didn't think at the time that there was much wheat grown in the Town of Dryden, but as it turns out, Cayuga Pure Organics had 30 acres of hard wheat growing in a corner of the town. I just bought 50 pounds of it (for $40), while visiting them at the Open House. Cleaned wheat at Cayuga Pure Organics. It was fun to see the cleaning process in action, and I'm happy to report that the wheat I bought seems very clean, much cleaner than some other wheat I'd bought in smaller quantities. Finding wheat grown in Dryden was a pleasant surprise, vastly more local than I had expected. 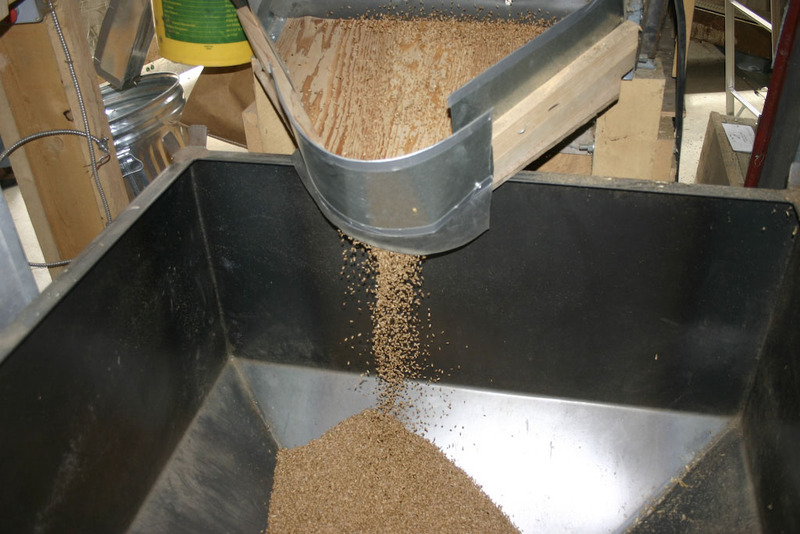 They'll also eventually have soft wheat, oats, and spelt, which we'll be using for more of our cooking. I've posted a gallery of photos of our adventures with wheat, if you'd like to see more. The main item missing from our local food collection right now is salad oil, which I'm sure we'll find soon enough! Update: My 10-year-old bread machine made a tasty loaf of Angelika's dense bread with pumpkin seeds using this new flour. 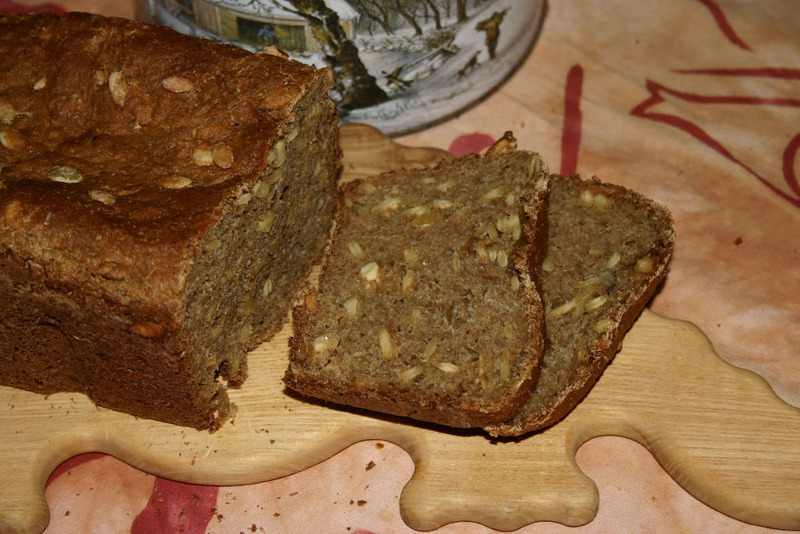 Bread made from fresh whole wheat flour. This morning's Journal doesn't have much specific to Dryden, but it does have an article on healthcare options for Tompkins County residents without health insurance, and another on state programs more generally. Looking for something to do this Saturday? The History Center's Eight Square Schoolhouse Festival will run from noon to 4:00pm at the Eight Square Schoolhouse on Hanshaw Road, just south of Route 13. It's a free event with activities for both adults and children. They'll have ice cream, music, games, storytelling, and of course the brick octagon schoolhouse itself. If you'd like to get an idea of what it looks like, I posted an article on the 2005 festival with a photo gallery. 12:00 - 12:45 Ring the bell and raise the flag - it's time to go "back to school" in 1892! County Legislator Martha Robertson just sent me a note with a reminder that the American Red Cross will be holding a blood drive Friday at the Varna Community Center (map) from 1:00pm to 6:00pm. More data is in the print edition, and complete data is available from the state, but here's an excerpt showing schools Dryden residents are likely to attend, plus Boynton Middle School for a comparison with DeWitt. The County Legislature voted to extend its participation in the Recreation Partnership for five more years. The Journal's editorial looks at the challenges of reaching everyone with health care in Tompkins County. I wrote earlier about The Orchid Place's building a garden for squash. They've had a sign up for a few weeks, advertising veggies for sale, and over the past few weeks I've gotten to try a few tomatoes, cucumbers, and squash, all quite tasty. Vegetables, in person: tomatoes, cucumbers, and OPO and bitter squashes. They aren't actually growing these huge volumes of squash for the neighborhood. Like the orchids, they're mainly destined for Wegmans. It's great that they sell them where they're grown though, giving people a chance to connect with food grown in their neighborhood. That big OPO squash made for a huge dinner last night, as you can see in the photo gallery, with plenty of leftovers. The cucumbers I'll eat raw. The bitter squash (white and green) is more of a challenge, though I like the idea of freezing thin slices and eating it with sugar. We'll see! Here you'll find information on everything having to do with sustainability from farm to kitchen and beyond. For example, gardening tips, recipes for healthy food with seasonal ingredients, and ways of finding your local farms and CSAs. We'll be celebratory, skeptical, and above all practical. Update: Alas, Beth is a Varna resident no longer - she just moved to Ithaca last week. There's an article in this morning's Journal that illustrates some of the problems I've run into when thinking about what "local" food means. The Ithaca Beer Company, whose products I've always enjoyed, is going to build a silo to store malt, which comes from a supplier in Wisconsin. Ithaca Beer certainly does its brewing locally, and sometimes (as in their Double IPA) with New York State hops, but the main body of the beer really isn't local food. One of the more problematic features of my house has been the approaches. The front entrance has steep wooden stairs that lead mostly nowhere, though at one point there must have been a brick sidewalk. 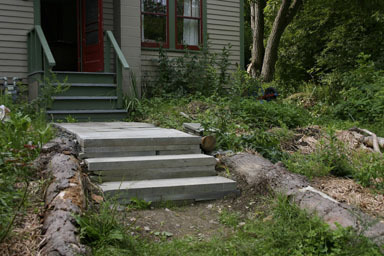 The back entrance has tilted concrete steps that originally led to mud, though I added a lot of sand and eventually flagstone. I'd bought a pallet of mixed stone from Finger Lakes Stone years ago, but mostly it just blocked a corner of the driveway, as it was too heavy to maneuver, and the stones I did place were mostly good for tripping people. 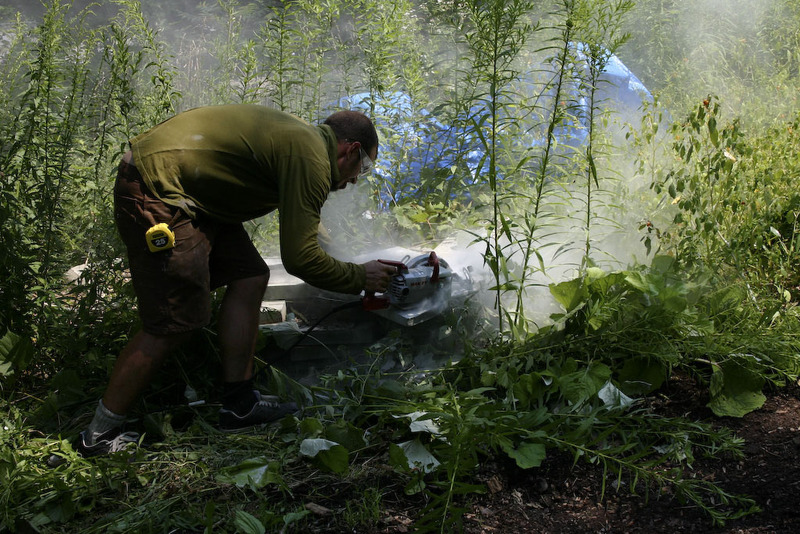 This year, thanks to Josh Dolan, our permaculture consultant, we finally fixed that. 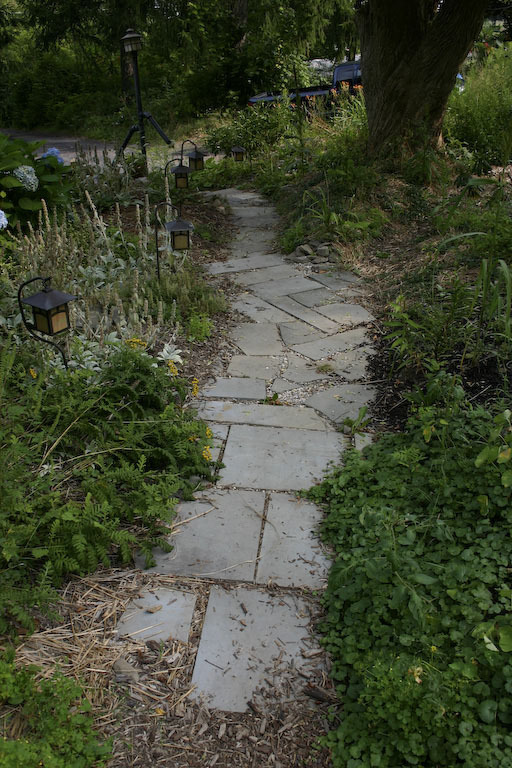 Before our wedding, he and some co-workers fixed the back sidewalk, removing the flagstone and finding another layer of flagstone buried underneath the old lawn. With those two layers, they were able to build a new walkway connecting the steps to where the mulch paths begin in our garden. In early August, Josh and his crew turned to the front steps. The wooden steps come to a concrete pad, and I'd tried to add some stone, but there's a strange bump in the hillside in front of the house that's meant slips and falls for years. We were out of the convenient flagstone from the back, so they turned to the pallet of stone. An expensive but effective stone-cutting blade from Seneca Supply, just down the road, helped them turn the large blocks into the right size of blocks. There's still some work to do, as this walkway only addresses the tricky part from the front door down the hill, and there isn't a path at all from the bottom step down to the driveway. We also need to see how these walkways do with frost heaves over the winter, always a challenging problem in this area. 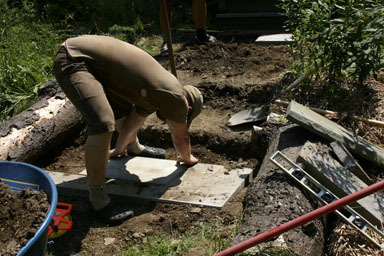 I've posted a photo gallery of some of the construction and results. Today's "All the People" party name made me go back to the latest voter registration data to see what's happening in Dryden. Blank registrations fell the most, and Democratic registrations fell one more than Republican. At this point in the election cycle it's not surprising to see the number of voters drop - many new people register for Presidential election years, fewer for Congressional years, and many fewer for the odd-numbered years. Democrats retain about a 250-voter lead over Republicans, but given voter turnout, I'd guess that those two sides are still about even. The part I can't quite figure out is the 75-voter drop in "Blank" registrations, without a party, since the last time I looked at this. Anecdotally, I'd heard of more people registering Blank, but I guess I'm talking to the wrong people. That, or they registered Independence, the only party with a substantial gain. 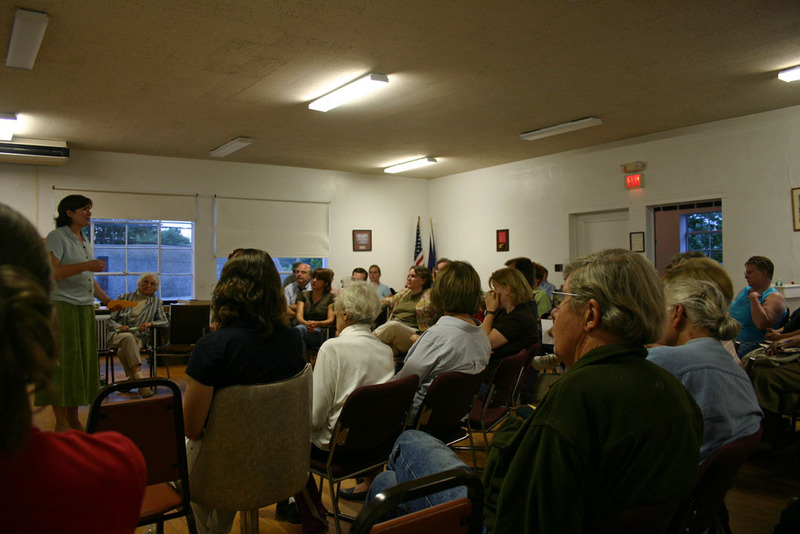 Last night I saw more positive community energy at Dryden Village Hall than I've seen at any meeting in Dryden. I'm guessing around 80 people showed up to hear what might be coming and to share ideas for a possible Community Cafe on the four corners in Dryden, at the former Charlie's Diner location. Kim Schenck introduced Wendy Martin, who originated the idea and has been pushing hard to see it accomplished. Martin gave the audience a "tour" of the proposed Community Cafe, describing what it might look like to approach and walk through the place. The setting, the people, the food and coffee, and the community information seemed to materialize in the room as she described it. Next, Elsie Gutchess spoke about the kid-friendly Dryden she had moved to in 1938, about a much more vibrant downtown, and applauded the organizers for their "giant vision to put a heart back in the center of Dryden." Much of the rest of the meeting was open discussion, in which probably twenty people added their comments and suggestions. This is kind of a summary of that conversation, though certainly not complete and not necessarily reflective of the direction the organizers will go on specific projects. The Community Cafe would be at the former Charlie's Diner, at the intersection of West Main Street and Route 38. Mark Goldfarb and Bob Porteus, who own the property, will support the project with at first a minimal and later a low-cost rent. The location is accessible from the back, though some work is necessary to improve that and perhaps make the back courtyard area more attractive. A key aspect of the Community Cafe is providing a place where people can come together and meet socially. Coffee, ice cream, and baked goods would be a key part of this, though they don't plan to ever become a full-service restaurant and would prefer not to compete with existing businesses. (Some speakers enouraged them to focus on locally-produced or roasted food and drink as well.) 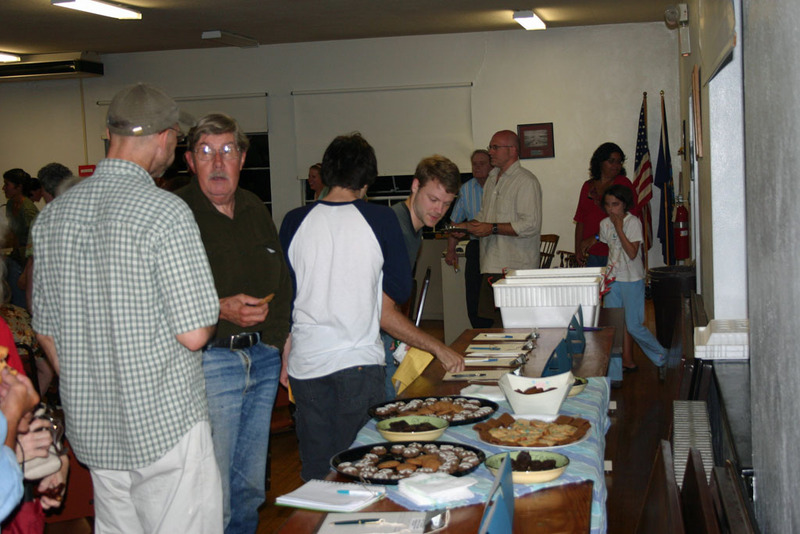 The Community Cafe could also host events, and would also be an information center where other Dryden organizations could present their activities. Apart from some equipment, the organizers are expecting to need about $2000 to get off the ground (for insurance, permits, etc.) and need to make around $1000 a month to keep the place going. The ongoing money seems likely to come from the coffee shop. Martin has been talking with the Town about their Community Center funds, and Town Board member Mary Ann Sumner attended the meeting and encouraged the group to apply for that money. There were several suggestions for musical fundraisers - band performances, "battle of the bands", a cappella shows, and more. A key part of the conversation was around making sure that kids and teenagers find it an interesting place for after school, but that's just one part of what they hope to have in a day. Martin talked about a shifting clientele, with adults in the early afternoon, young people when school gets out, and possible events at night. That may be a bit tricky to manage, but the building can be configured to have a few different spaces, and hopefully can prove a home to a community that includes senior citizens, teenagers, young parents, old-timers, newcomers, and a wide variety of other groups. There were some concerns about "management by consensus" and a suggestion that perhaps the Community Center should hire a franchise coffee place. The franchise suggestion went over pretty badly, at least in the corner of the room I was in, but there was a lot more positive murmuring about the need to have a manager and possibly eventual paid employees to keep the place running when volunteers weren't available. Martin had already lined up some baristas with lots of coffee shop experience. There was also some broad conversation about downtown Dryden that I think it's important to consider. Martin mentioned the Village of Groton, a place that seems to be doing very well lately. Groton's downtown is comfortable, and business seems more stable. They have a coffee shop, bars, restaurants, and stores. The other end of the Purple-Green rivalry seems to have some advantages at the moment. There was a regular current in the discussion of the need to revive downtown Dryden, and to get the four corners busy again - with foot traffic and business, not just the flow of cars and trucks. Another conversation I liked began when Martin mentioned that Mark Goldfarb had asked her what failure would look like. She said that even if this didn't quite take off, and only lasted six months to a year, a lot of people would already have met each other in that time and made new connections. She's already made lots of connections through this project, and so have other participants. Margaret Lorentzen picked up that thread, telling of a dairy bar her sister had started to give local kids a place to go. It didn't work out as a business, but she met her husband there! In one of the last comments, Anne Rhodes pointed out that what they were proposing was difficult but worthwhile. People spend their time in their cars, watching television, and on the Internet, and in their separate homes with little need to go out. She called for the organizers and supporters to be creative in getting people to come out of those pursuits and connect to each other as neighbors. At the end of the meeting, people enjoyed the snacks and signed up to help. If you'd like to see a bit more of the meeting, I've posted a photo gallery. Update: WHCU reported on last night's meeting. I was glad to see Geoff Dunn, their news director, there. I think that the Journal had someone there taking notes, so maybe we'll see a story from them too. National politics already gets enough attention. Usually not the kind of attention I'd like it to get, and the conversations are often brutally polarized, but the conversations about national politics are loud and continuous. National politics seem to blot out people's attention for more local issues, and even keep people who could work together on local projects from doing so. New York State politics is a disaster. The Senate and the Assembly are both rigged games, thanks to gerrymandering and the concentration of power and patronage in the legislative leadership. Both major political parties are deeply tangled in the mess. Governor Spitzer's steamroller seems to have tangled itself in the Albany muck. I still have visions of what a vibrant New York State political life might look like, but usually they stay buried in despair over an utterly broken system. While New York State politics certainly needs more attention, it's hard to watch for long. Upstate New York is home. I grew up in Corning, and my mother's from Auburn. I don't believe there's a better place in this country to live, and I've seen a lot of it. Four real seasons may seem inconvenient to some people, but it gives us an incredible changing landscape, blessed with readily available water supplies and a complete set of opportunities to support people. I know everyone thinks "Upstate is in decline", and from a certain perspective, it is - but I see better potential for stable long-term prosperity here than anywhere else in this country. My neighborhood - from the 13/366 overlap to "downtown" Varna - is just plain interesting. The more I think about it, the more miraculous it seems that the Varna Community Association has been going for over fifty years, despite a neighborhood wracked with traffic and a population that comes and goes. The last four years have seen some dramatic change around the 13/366 intersection. Even as NYSEG's turned out most of the lights in their crazy fortress, two new places have appeared where I can buy vegetables, an old and decaying house has returned to vibrant life, and people seem to be recognizing that there's change in the air. The people are fascinating, and real. Talking about local issues almost always means talking about the concrete, and people's own hopes and fears come to the surface easily. It's not (usually) about political party or ideology, but rather about how best to get things done, and how to choose which things need to get done. The variety of perspectives is amazing, and the overlaps and crossovers in how people would like to prioritize are both marvelous and perplexing. The hard part is getting them talking. I'm convinced that we're all going to need our immediate neighbors more in the future. Why? Because pretty much everything that's made it easy to ignore our neighbors depends on cheap energy. I don't see much hope for thinking that energy will stay cheap, as worldwide demand is increasing much faster than supply. Some key parts of our supply may be peaking or even declining, and neither ethanol nor hydrogen will magically provide us with more cheap energy. (Nuclear energy and alternative sources may help buffer that, but "too cheap to meter" doesn't exist.) We're going to have to adjust to gasoline, natural gas, and electrical prices climbing, and will have to figure out how to economize on a lot of things that once seemed cheap. I'm sure that last bullet will raise some eyebrows. I know plenty of good people who don't think $10 for a gallon of gas is possible, because technology will save us. I know lots of bright people think a 50-mile commute is reasonable. Perhaps craziest of all, people with strong environmental beliefs seem to move to the middle of nowhere but spend a lot of energy traveling from there rather than joining their neighborhood community. Our neighbors aren't just part of the landscape - they're our community. People who can help us, and people we can help too. We may not agree with our neighbors, and we may sometimes not even like our neighbors, but all of us together will define what happens to the place we share. When we start thinking about people in huge numbers, it's easily to abstract away their humanity, and treat them as blocks. When we focus on people in smaller numbers, we can start to see what we have in common with them, and what we don't have in common, and work on ways to build that commonality - even when it's difficult. Building those connections is what Living in Dryden is all about. The site itself can't create the connections among its readers - but hopefully it makes it easier for you to build those connections. This morning's Ithaca Journal reports on last night's storms, which dumped more than three inches of rain in the northern part of the county, including Lansing, Groton, and Dryden. We didn't seem to get anything here but thunder and lightning on the horizon. The Journal also explores NYSEG's plans for smart metering, which will let consumers and the power company see how much power is being consumed and when. On the one hand, I'm suspicious of pretty much anything NYSEG does which might affect bills; on the other hand, I can see where flexible pricing might encourage people to install home solar panels if the smart-metering program allows for power to back into the grid at the same rates we pay for it to come out. Update: I missed this article on TC3's new athletic facilities. This week's Dryden Courier just arrived. It reports on Dryden Schools Superintendent Mark Crawford's impending departure for his hometown of Hamburg, where he'll be taking the Superintendent's job. There's also an article on the Lower Creek Road curve that's been a persistent problem for Etna resident Joseph Solomon. Cars crashing into the house, squealing tires... and perhaps worst of all, the drivers blasting through the curve are likely local traffic. The Town has a few ideas for fixing it, and I expect we'll see more public discussion at the Town Board. There isn't much opinion on the Opinion page, just an editorial about hunting deer for herd management inspired by a recent VIllage of Lansing vote. They do, however, include the Dryden Fall Modified Sports schedule and note that Carolyn Edgecomb of Dryden made the Dean's List at the College of St. Rose. Matt Cooper's Inside Dryden column explores using MySpace to sample the bands coming to Music in the Park, notes the Community Cafe meeting and Varna Methodist Church barbecue that were still to come when he wrote, and notes next month's Freeville Festival, which will be September 15th. He also reports on his recent adoption of a cat from the Tompkins County SPCA. A report on the Village of Dryden Trustees meeting includes a concern over possible development overloading the Village's ailing sewer plant, a challenge made worse by the Village's not yet having reliable flow data. (That seems to be taking forever, at least from what I've heard at the Town Board.) Mike Lane raised the question of including Freeville in sewage plant discussions, and it sounds like there was some confusion over whether Freeville had been invited or not. He also thanked the board for providing space for Amy Dickinson's recent presentation benefiting Southworth Library, and noted that her publisher had agreed to make a donation of 1,000 books or the cash equivalent to the Library. The village also annexed some additional land along Route 13, including the A1 Restaurant. There's also notice of an opening on the Dryden Youth Commission and a request for programming. It looks like there was a lot more excitement than is good on Mount Pleasant Road yesterday, as a gravel truck overturned when it went off the road into the old railroad bed. The driver kept the truck from crashing down into Route 366 when its brakes failed, but the photo makes it clear that it wasn't an easy stop. The driver had minor injuries, but acting Varna Fire Chief Scott Baylor makes it clear that the driver's quick action averted a much worse possible disaster. This morning's Ithaca Journal visits the Eight Square Schoolhouse festival, which I missed this year. It sounds like they had they usual fun re-acquainting people with the schoolhouse, which last served as a public school in 1941. 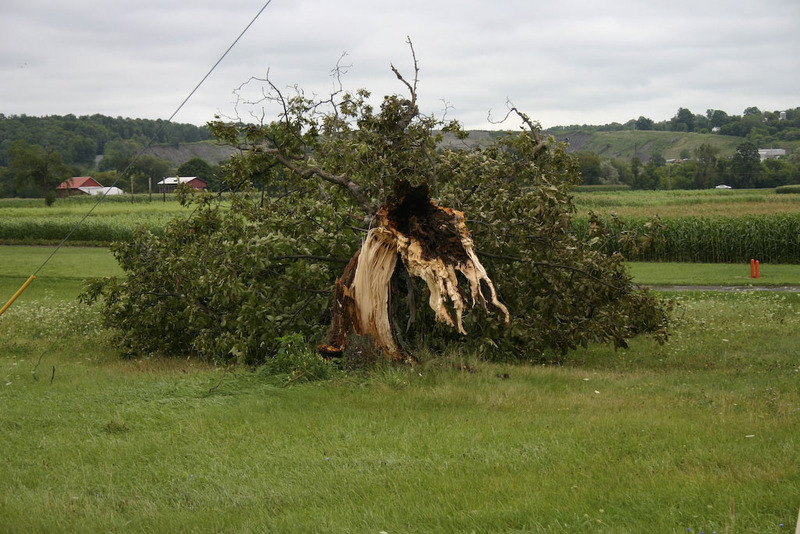 Storms continued to pound Dryden and the surrounding area Saturday night after Friday's damage. We were brush-hogging out in Freeville, and I could see lightning to the south and east, on Mount Pleasant and over by the Village of Dryden. Then it started coming toward us, and fortunately we finished up and cleared out just before the rain and lightning arrived. 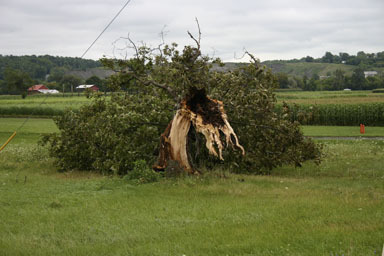 Fallen tree along Ed Hill Road. I spent a lot of the weekend behind a brush hog, clearing paths through overgrown fields and forest. Angelika's orchard-to-be is off Ed Hill Road north of Freeville, and it's on land that's well into the succession process. Much of it is covered in hawthorn and buckthorn, with some old pathways taking longer to grow over. We interrupted that growing with a 17 horsepower DR Field and Brush Mower rented from Cortland Rental Center over the weekend. Angelika had already cleared the driveway with a smaller brushcutter so that we could get in and work in the main area of her planned orchard. We unloaded it from the truck (I'm very glad we rented a ramp!) and got to work. 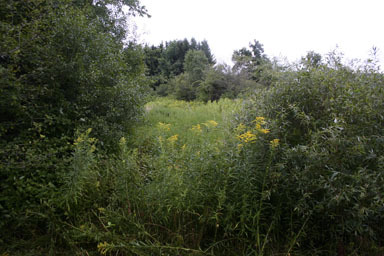 Mowing down goldenrods and similar small stuff was easy, as was small brush. The main challenge was multiflora roses. Individual rose bushes disappeared easily, but dense thickets were hard to get through. The machine could cut them, but it took a lot of back and forth to cut the thicket without getting cut to pieces by the thorns. I felt really powerful as I was using this crazy machine - until the thunderstorms came in Saturday night and I could see the lightning all over the south. Then I felt awfully small. When we came home and looked at an aerial photo of the site, I could see where I had been cutting, and it went a long way - but was still a tiny portion of the overall area. 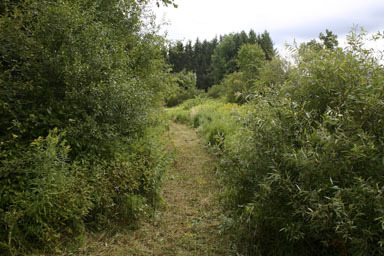 Most of the orchard area is forested, but we cut some long trails through its southern meadows to make it a lot more accessible. I cut four meadows in as well to be staging areas, and we cleared a small area for a storage shed. Angelika will start work on replacing much of the light forest with more useful trees this fall, though it will be a slow process taking many years. 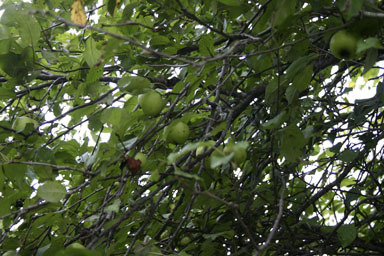 In a good sign, there are already apple trees scattered amidst the others. Following up on their energized meeting last week, the Dryden Community Cafe has launched a weblog. I'm sure there will be a lot more coming there. I mentioned some skepticism about local food from the market-oriented side of the world. Lately I've been encountering more skepticism about local food and broader relocalization from a different set of critics. On the Sustainable Tompkins mailing list, a New York Times op-ed ignited a skeptical thread about the value of emphasizing local food, and more recently there was a broader questioning of the value of localization without some kind of large-scale political movement and then a further look at relocalization as a strategy for dealing with likely difficult change ahead. I may have been too cranky when I wrote "I see more hope in the potluck or the barbecue than in the revolution," but we'll see how the world turns out. On the Finger Lakes Permaculture list, a busy thread on the Eat-Local backlash brought up more interesting concerns, especially around grain. Sure - there's lots of different cause for skepticism. That doesn't mean it's not worth doing! The print edition of this morning's Journal finally catches up to the runaway dump truck story they ran online on Friday. It also looks like the county can likely meet its budget goal. Cathy Wakeman's Dryden Town Talk reported yesterday on scouting and youth activities. She noted that Girl Scouts had planted trees to help stabilize Virgil Creek, and both Boy Scouts and Girl Scouts are getting ready for more activity with the new school year. She reports on the Dryden High School Student Council's upcoming 5K Dryden Dash for Charity, which will be held September 30th as a fundraiser for the Make-A-Wish foundation. She notes the Dryden Youth Commission's call for programs and for a new member, and also reports that donations to the Southworth Library book sale will be accepted until September 14th. The sale itself will run September 20th-22nd. On page 4B of the print edition of today's Journal, Elia Kacapyr reports that July's economic activity looks bleak, with 1500-person drop in employment, even after seasonal adjustment. (I'm a little curious where those 1500 jobs were, since I don't think I've heard of many layoffs, and some new businesses have opened.) Retail sales fell a bit, airport boardings climbed a bit, building permits jumped (66%), home sales fell (25%), and help wanted advertising climbed a bit. In breaking news, the State Business Council gives upstate, and Tompkins County an "F", something I'll talk more about later. When I was in college, I learned pretty quickly that I should say I was from "beautiful Upstate New York" instead of just "New York", because the question "Which borough?" got annoying quickly. Still, I have connections to the place - I lived on the western edge of Manhattan from 1993 to 1996, and my brother lives in Brooklyn. I used to go there fairly frequently, for conferences and presentations, but it's been at least three years since I'd been there. Lion at the New York Public Library. We went to the consulate first, where everything went smoothly. Afterwards, we walked around Manhattan, walking through midtown to a favorite restaurant of mine, then further downtown where I'd lived, worked, and gone to graduate school. 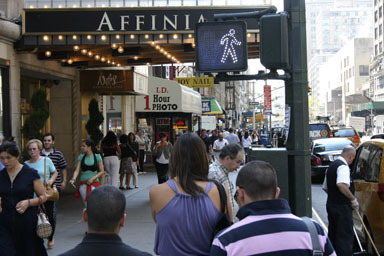 New York City sidewalk scene. A definite highlight was lunch. 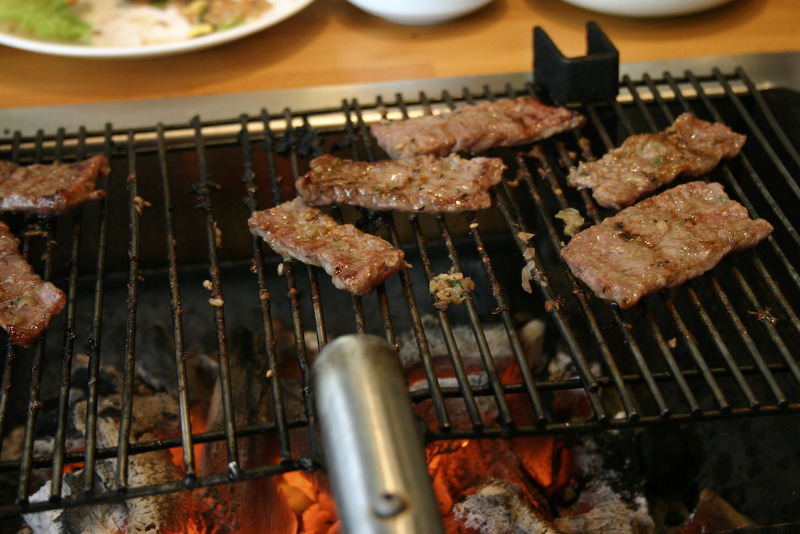 The eating local rules don't apply when traveling (though we'd brought Sansa apples from Cornell Orchards), and we visited one of my favorite restaurants, the New York Kom Tang Kalbi House, on 32nd Street between Fifth and Sixth Avenues. 32nd Street seems to be the heart of Manhattan's Korean neighborhood, and has lots of restaurants, but I've always liked this one. Kalbi grilling at the table. 29th Street between 7th and 8th (and especially Kremer Pigments, which was an amazing place to visit). The much-improved apartment building where I used to live. I'll be writing more about New York City soon - less as a tourist, more as someone figuring out why Upstate doesn't work the way it used to. I suspect most Living in Dryden readers are here for the subject and not for the writer, but there are a few who seem to read several blogs I write. I just updated my personal site to combine my recent postings from various different sites into a single stream of information. If you want to keep up with what I write about technology, state politics, or Quakerism, it's all at http://simonstl.com/. This morning's Journal reports that the Business Council of New York State's Public Policy Institute gave Tompkins County an "F" for not growing fast enough. We didn't beat the national averages in growth in the total number of jobs, average annual wages per job, total personal income, per capita personal income, or population growth. Most of upstate outside of the Hudson Valley did similarly poorly by the Business Council's standards, as growth concentrated in the New York City area. I like a lot of Jay Gallagher's reporting on state politics, but in this article he seems content to parrot the Business Council's claims, without even asking other sources what they think. Remember, these are the same people who publish upstateblog.net, now apparently renamed "Knickerbocker Blog". It's basically an endless torrent of newspaper cuttings and links with commentary designed to make readers think that all we need to do is cut government, taxes, and regulation, and New York State will burst into productive flame, making everyone rich. I'm sure it's chicken soup for some people's souls, but it hardly makes me trust the Business Council. Upstate needs to find a path that works better than the one we're on. I think - for reasons that I'll explain this weekend - that the Business Council is looking at the wrong criteria to promote the wrong agenda for Upstate New York, however. For Exhibit A in that case, I'd note that Arizona got a A+ and Vermont got a D, giving rootless and sprawling Phoenix a gold star while finding Vermont's communities just not good enough by their numbers. The Journal adds a little bit of explanation for Tompkins County not looking as good as perhaps it should, around the issue of people who commute in for work not being counted. I'm guessing that from the Business Council's perspective it might be the difference between a D and an F, and probably not really worth arguing. In late-breaking updates, one lane of the Ringwood Road bridge will be opening this afternoon, which should make getting home a lot easier for some people.